It was bittersweet, that last day of baseball. If your team is still playing … and eight teams still are … well, good for you. Your summer goes on, at least for now. At least for a few more days. This is for the rest of us. Whether your team was good, but not quite good enough. Or, your team was meh. Or, whether your team lost 115 games which put it so far below meh, that a meh season seems like something one should aspire to. The Oriole Bird has smiled through all 115 losses. Stupid bird. No matter what your team did last Sunday, if your team was one of the 20 that weren’t quite good enough to play this week, that Sunday was the end of summer. The Orioles won that day. They beat the World Champion Houston Astros, who are still playing, and last Sunday, with nothing to do but wait for their postseason to begin, Houston let their superstars have a single swing of the bat and then gave them each a Sabbath-like day of rest and let all their “other guys” play. It was, for them, a meaningless game. Should the Orioles have faced all the “other guys” this season – the “not quite good enough to start” guys – I promise you that they would not have lost 115 games. If you’re going to say goodbye to a season of futility, a season so rotten it makes all the other rotten seasons bow down in awe of the putrescent rottenivity of the Orioles 2018, it’s best to be there. And, the day was perfect. 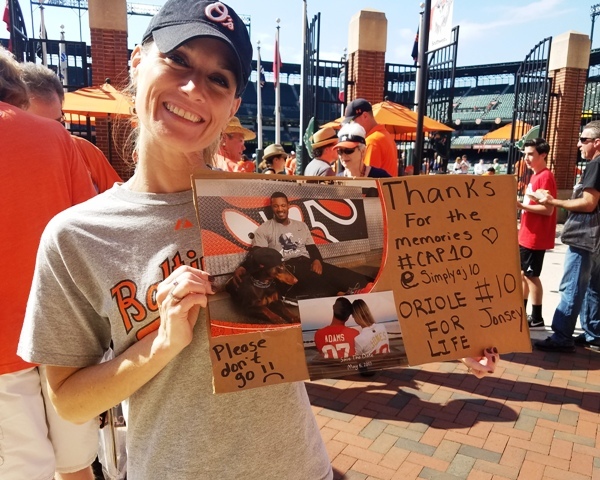 And, the fans came to say goodbye to beloved Adam Jones. 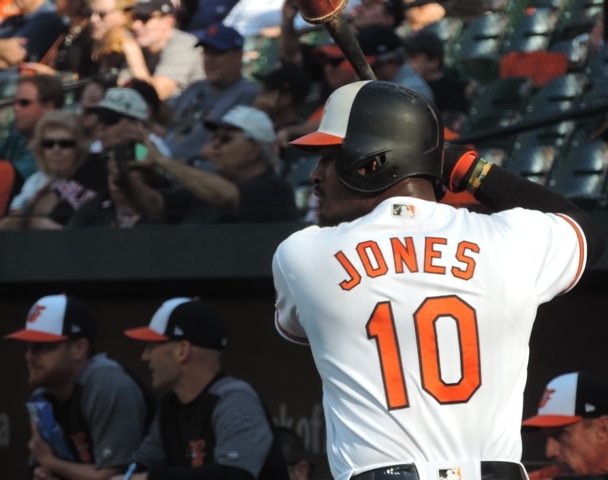 Jones was, since 2008, the Orioles steadfast centerfielder, until in this new Orioles age of rebuild he was shifted to right field in August and in not too long he will be shifted over just a little more … and a little more … until he is finally shifted completely out the door, because, apparently, rebuilds have no place for hardworking players, no matter how hardworking, no matter how beloved, if they are over 30. 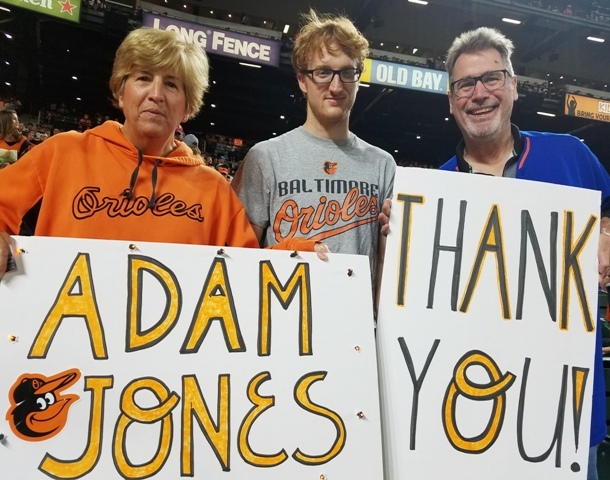 So, on Saturday, the Orioles congratulated Adam Jones for his family’s donation of $150,000 to community work in Baltimore. And, on Sunday the Orioles congratulated Adam Jones for being chosen Most Valuable Oriole. And, the fans cheered for Adam Jones for sticking around through this horrible, horrible season. And, the fans said goodbye. Kim on the left, Frank on the right. You can’t see it here, but Kim’s sign was lit up with bright orange lights. And, Adam said goodbye back. He was pulled from the game toward the end. He tipped his cap. He hugged his friends. That’s all. A rebuild is bigger than loyalty, I’m afraid. It’s about winning. A rebuild reminds everyone that baseball is a young man’s game. And so, summer is over. And, there’s always next year. There’s always next spring. But, it won’t be the same. When I was small, my happy place was my grandma and grandpa’s cabin. It sat by a small lake a few miles from a small town in the middle of North Dakota. There was a much bigger, far more popular, lake nearby. But, our cabin was on the small lake. The quiet one. The one surrounded by trees. The one where you could pretty much see the entire shoreline from any of the cabins that dotted its edges all the way around. I loved that cabin. I loved every minute in that cabin at that lake. I won’t tell you all about it now – although I remember each nook and cranny and can draw its simple two-room blueprint and hand-me-down furniture in my head, without a single photo. When summer was over, when the real work of harvest time began, my grandparents closed up the cabin for the year. And, I was always jealous of the kids who got to linger … who still had their weekends at their family cabins at the lake far into the last days of summer, when our cabin was closed up and we were back at the farm. And, I’m a little jealous today of those fans who still have baseball. Still have teams to root for and games to play. The Orioles let their manager go this week (and people were sad) and they let their general manager go this week (and people were less sad, because he’s an easy one to pin each of the O’s 115 losses on). And, most likely they will let Adam Jones go to another team. I miss my grandparents’ cabin. I miss baseball. 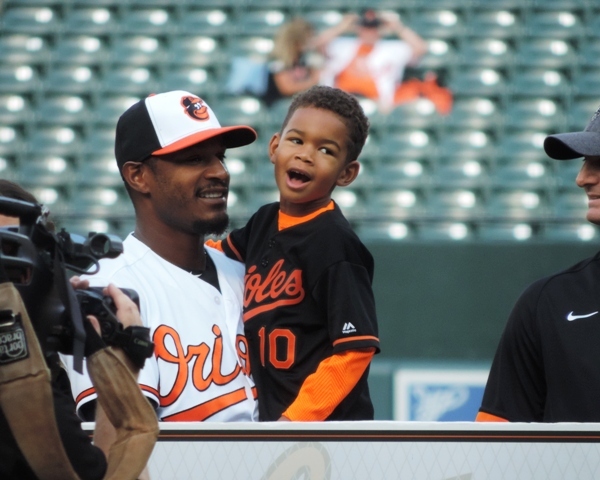 And, I will miss Adam Jones something fierce. It’s 80 degrees outside today in Virginia. It’s humid and sultry and the trees are still pretty green, fighting that instinct to turn to orange and yellow and red. The hummingbirds are still at my friend’s feeder, not yet ready to leave. But, it doesn’t take a genius to know that summer isn’t defined by green leaves and hummingbirds. Summer is the cabin by the lake. Summer is baseball. And, I miss it already. 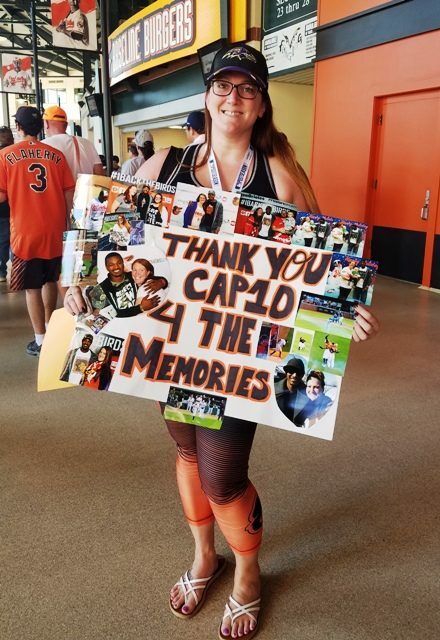 This entry was posted in Baltimore Orioles, Baseball, Life and tagged Baltimore Orioles, summer by Jackie, The Baseball Bloggess. Bookmark the permalink. I can’t believe the Orioles let Buck go, but this is sports. You can’t fire the players, so let’s fire the manager. 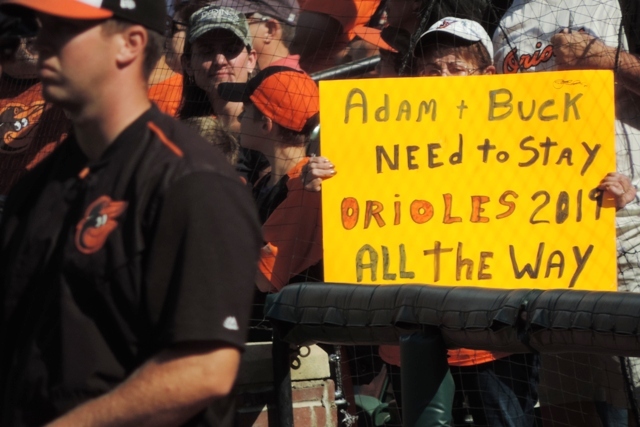 Adam should stay with the Orioles . It won’t be the same without him killing my Yankees every time we play you guys. I hope next year’s Orioles return to the Orioles team that I know. One that would compete with the Red Sox and the Yankees. Give us a couple seasons, Sportsdiva. We’ll be back. But, it’s going to take awhile. Yes, summer is over and we’ll soon be facing the winter of discontent in more than one way. But there’s a reason why we say hope springs eternal. It’s because that’s when baseball comes back. So, I will practice patience until then and keep looking forward to reading each and every one of your blogs to brighten the days. The sad Baseball Bloggess is here for a little while more. The happy Baseball Bloggess will be back … soon. Soon-ish. will be joining you soon for winter break. Yep I kept reading. I just had too! Fine job of summing up the ending of 2018. Mookie is crossing his paws for your Rockies … because he knows that there is a plate filled with delicious treats if they win the World Series. So, he’s rooting for you! Great post! I love that you’re a diehard Orioles fan. I agree with you 100% about Adam Jones. It’s sad how the modern game has no place for solid people and players once they get older and have a higher salary. If they’re not part of a rebuild, then they’re gone. It’s too bad. We’re not gonna see many more Cal Ripken’s, Chipper Jones’s, etc who play for one team their entire careers because even if the player wants to stay, the management doesn’t want them. It’s a shame. There is something so nostalgic about a player who is given the opportunity to stay with their team for their entire career. When I wrote about Nick Markakis leaving the O’s back in 2014 I discovered a fact from the Bureau of Labor Statistics that the average American has been with their employer just under 5 years. So, I guess that we are all transient workers … and Adam’s 11 seasons with Baltimore was well above the American average. That’s assuming, of course, that Caleb is asked to stick around next season, of course. And, who knows! This is going to be a very strange off-season for the Orioles. Change is never easy … but I don’t recall it being as weird as I think this one will be. We just have to hang on and hope for the best! Yup. That pretty much sums up where the Orioles are. I just commented on today’s post, sending love to Mr. Schoop. It’ll be OK, I sure hope so anyway! Come on, Crew! !